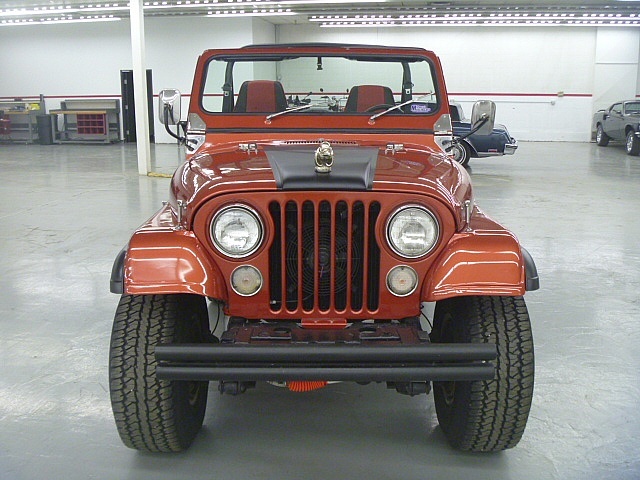 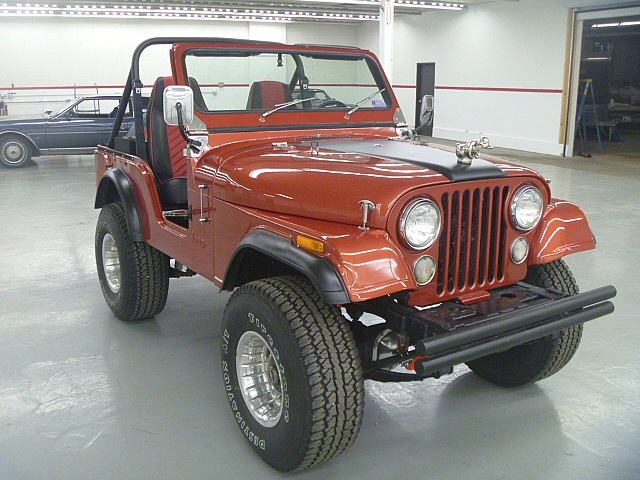 The timeless CJ was just about the purest expression of civilian-grade off-road fun ever created. 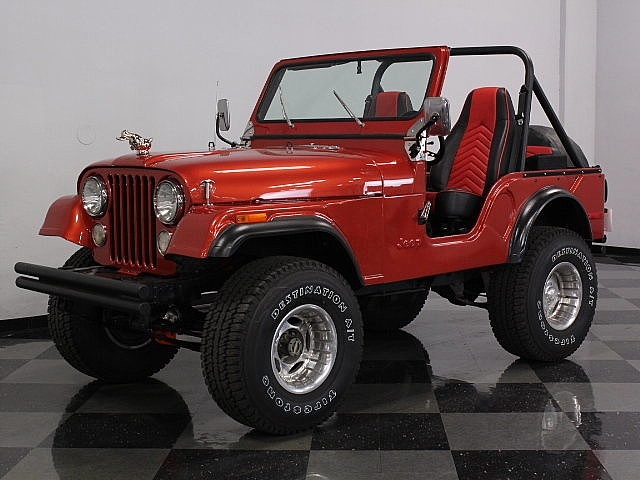 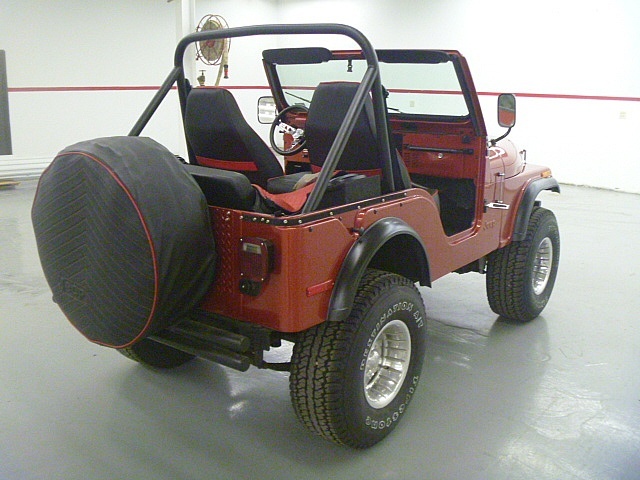 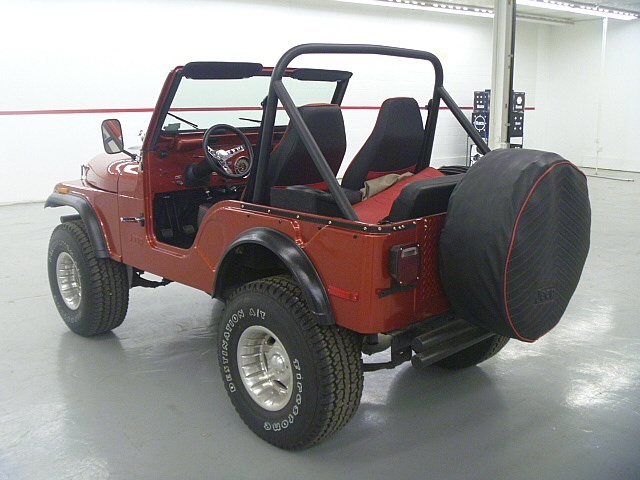 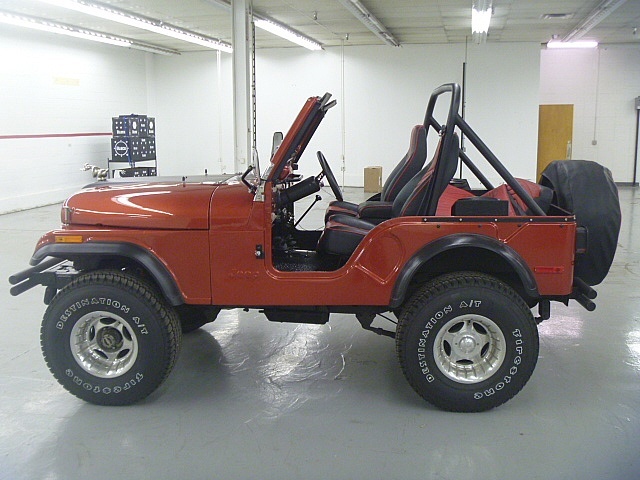 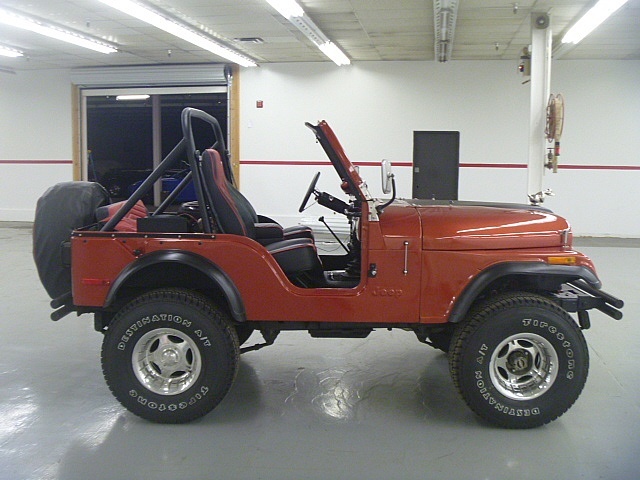 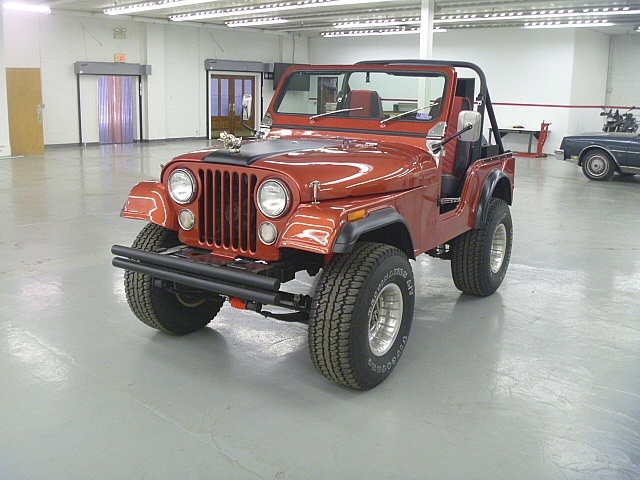 This 1976 CJ5 offers a nice restoration with a few smart upgrades, making it stylish as well as capable in the rough stuff. 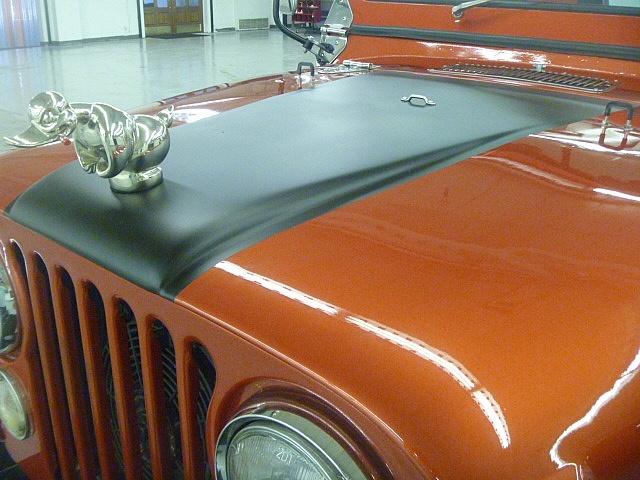 The classic Jeep lines look great no matter what color you paint them, and this one clearly had a ton of time invested in the final result. 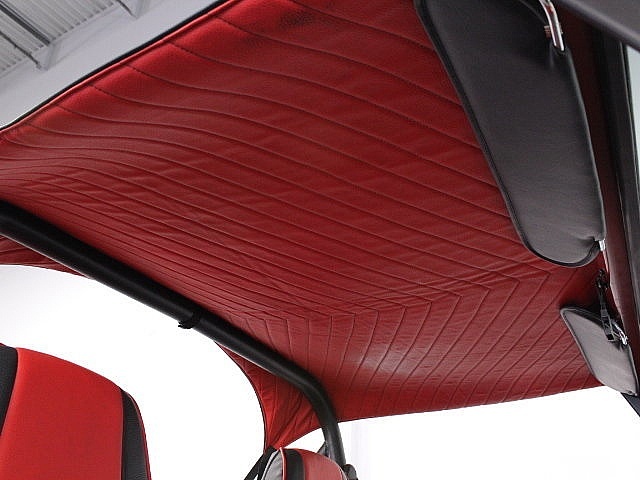 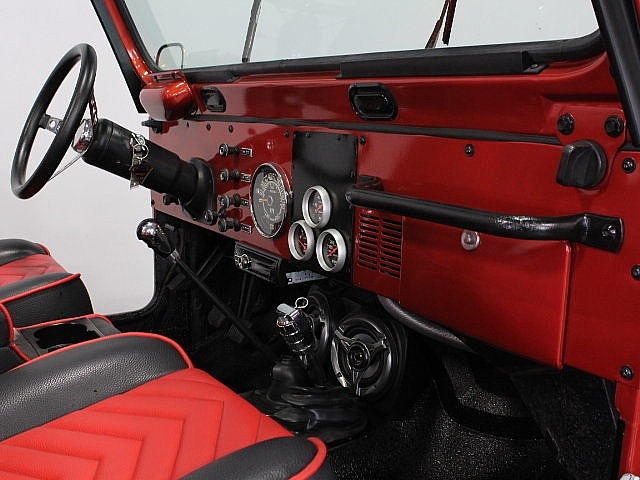 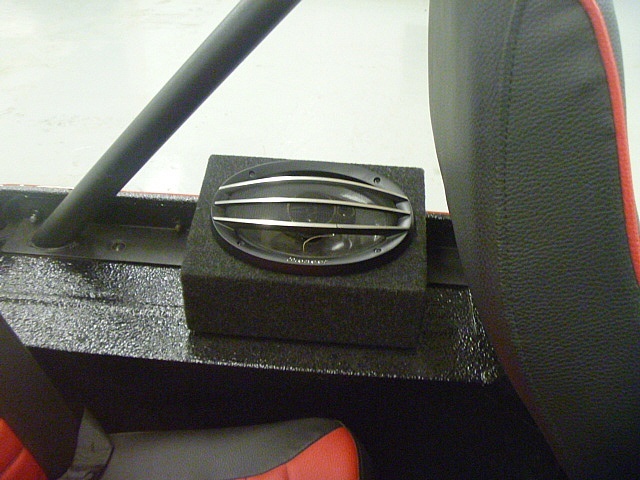 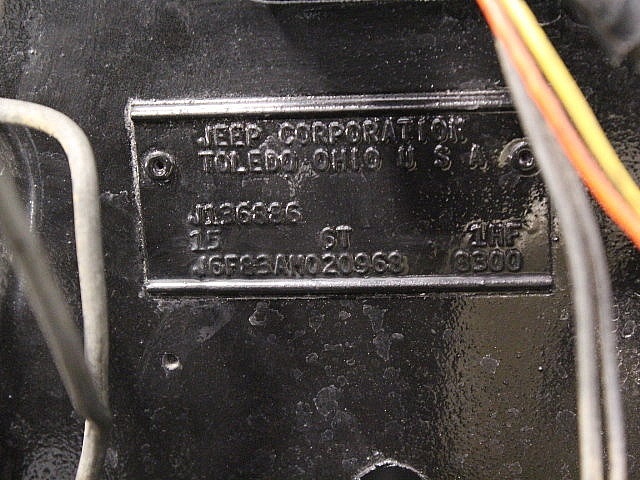 The shape is familiar and we have always liked the little details that make the CJ5 special, things like the indentation behind the doors, as if a shovel was supposed to be strapped on, and the exposed hood latches. 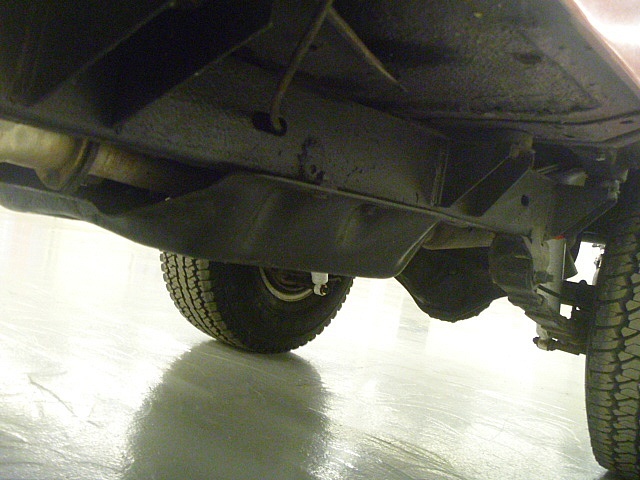 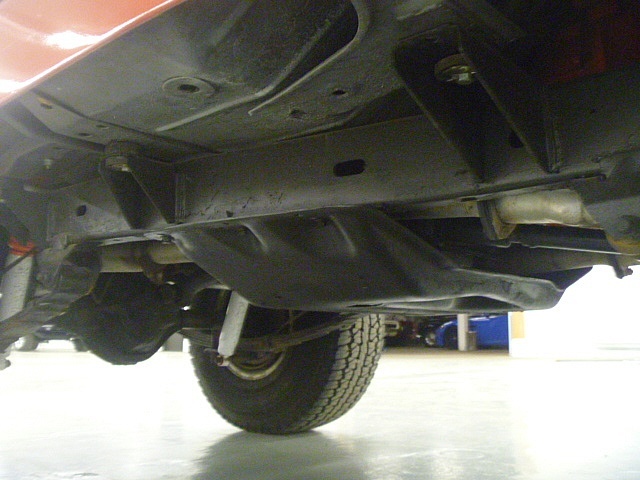 The tailgate has been welded closed to reinforce the tub and give the giant spare tire someplace to hang, but the rest of the body is quite stock. 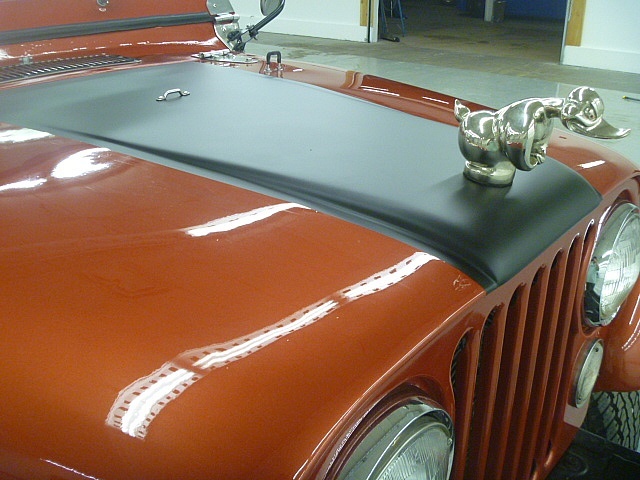 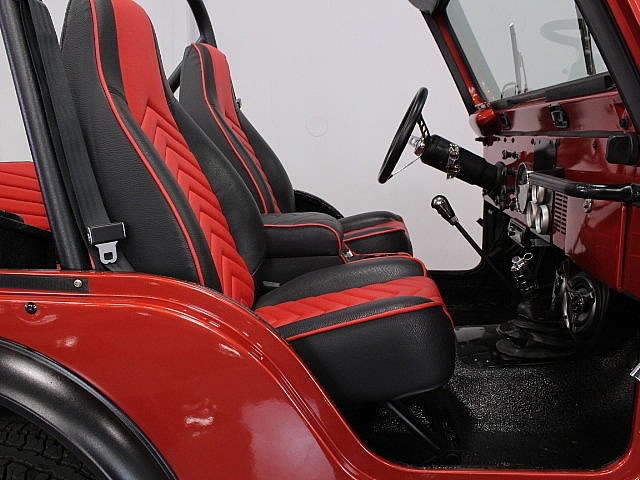 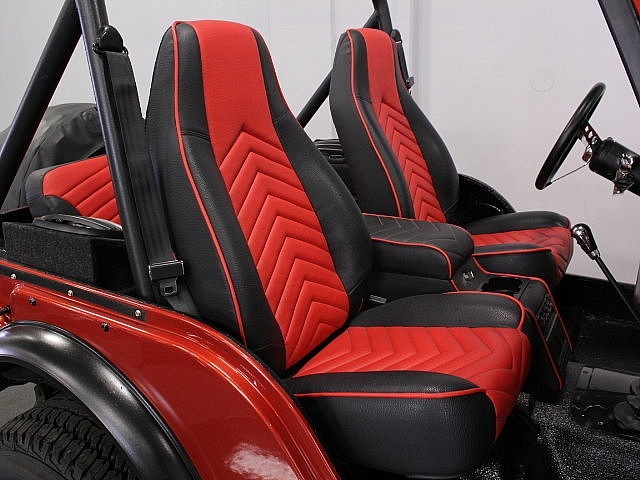 The paint is modern urethane so it shines up nicely after a day of playing in the dirt, and while Jeeps were never renowned for their fit and finish, this one looks great. 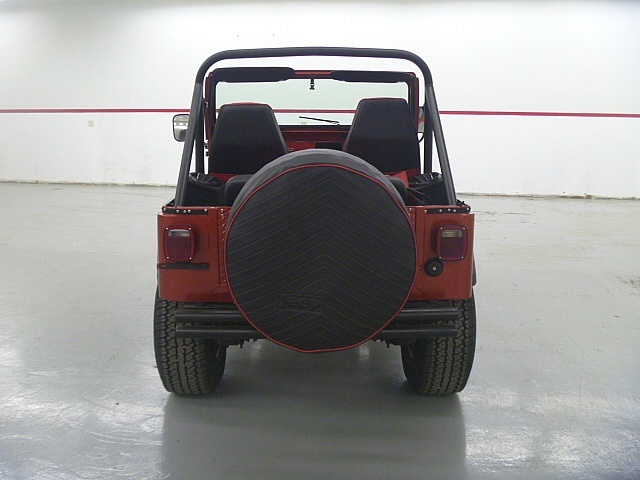 New black rubber fender flares cover the oversized tires and it includes correct little details like side marker lights, proper Jeep taillights, and black tubular bumpers fore and aft. 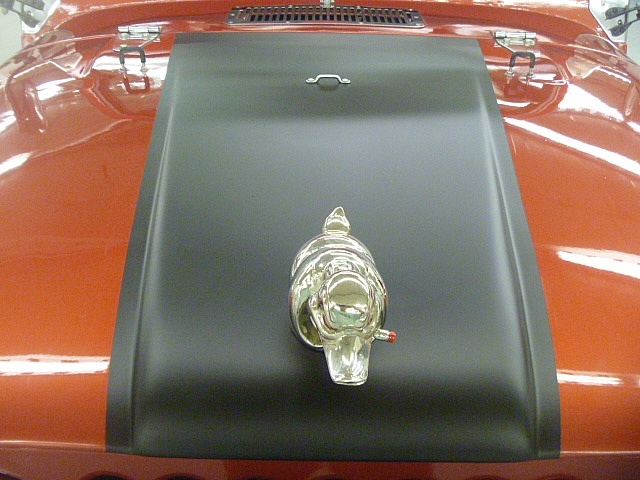 And yes, that’s a chrome duck on the hood and no, why don’t know why it’s there. 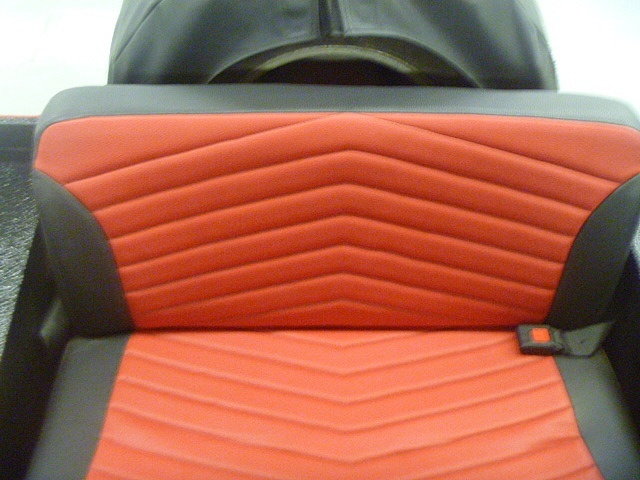 All we know is that we like it. 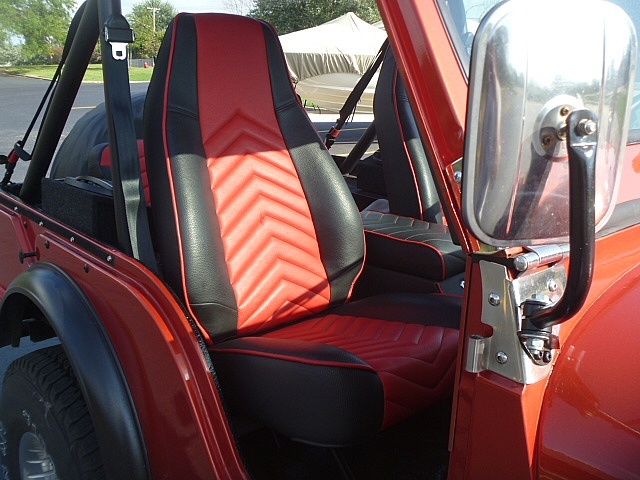 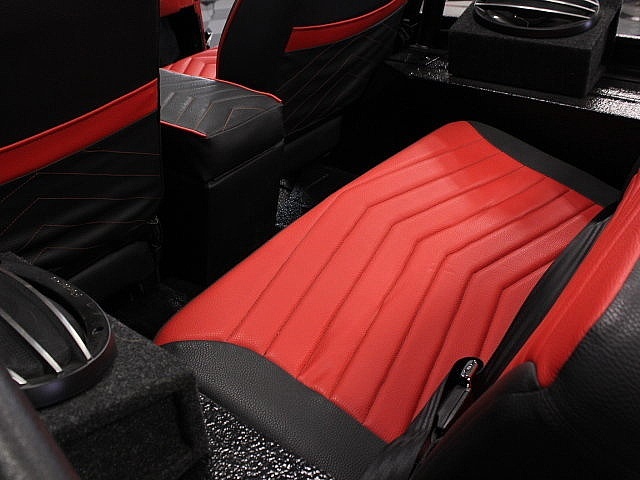 Recently installed two-tone seat covers anchor the nicely appointed interior. 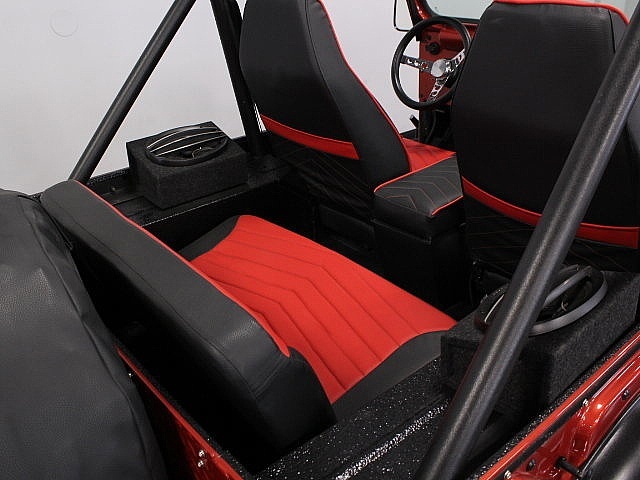 The same bright orange paint used on the body covers every unfinished interior surface, including the dash, and the floors are covered in spray-on bedliner material which makes for easy maintenance when you’re out playing in the mud. 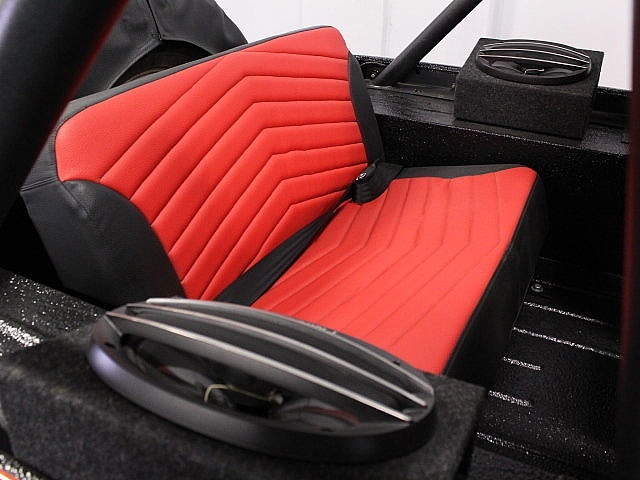 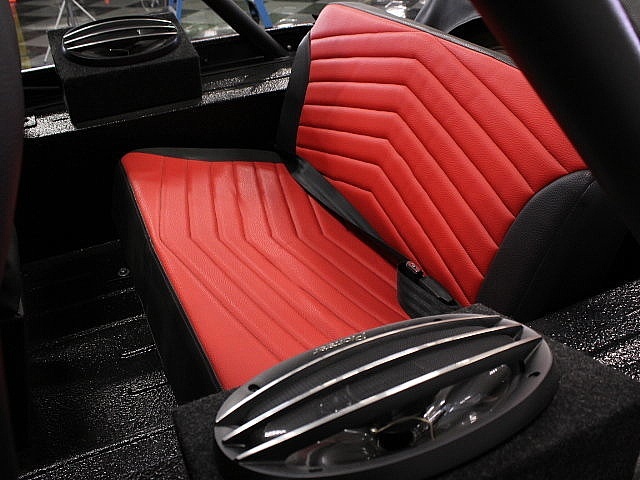 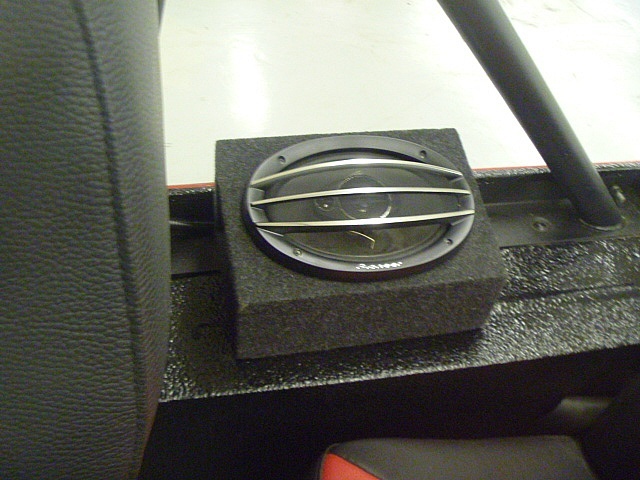 There’s also a stock rear bench for a pair of friends, and it, too has been upholstered in two-tone vinyl. 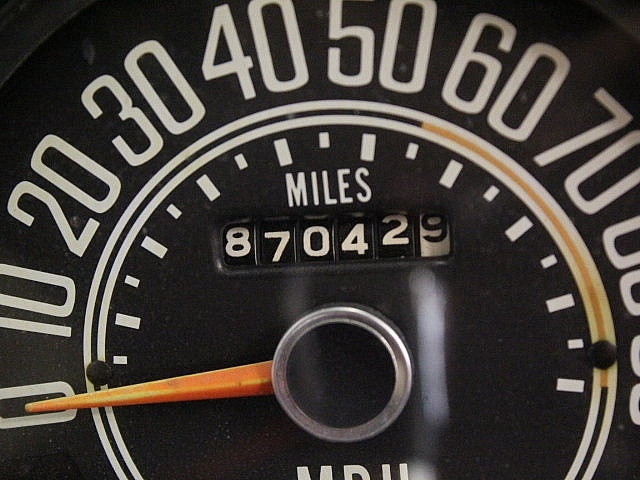 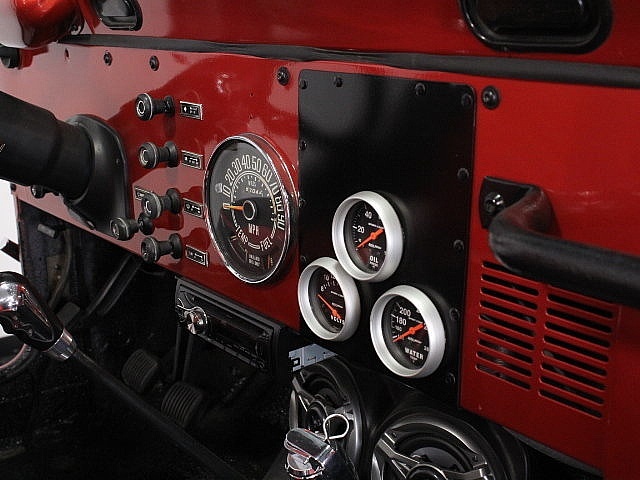 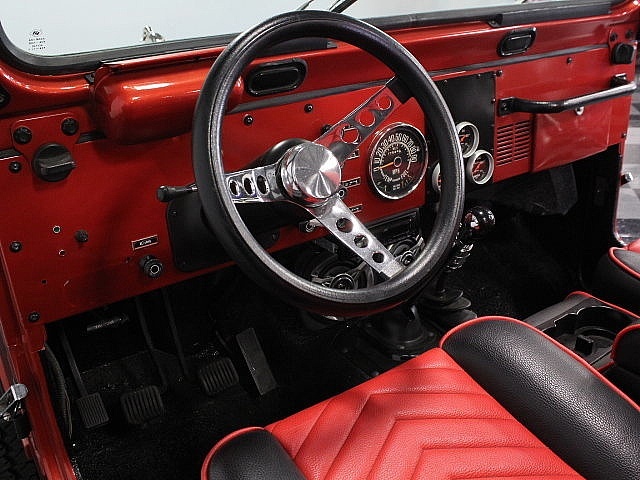 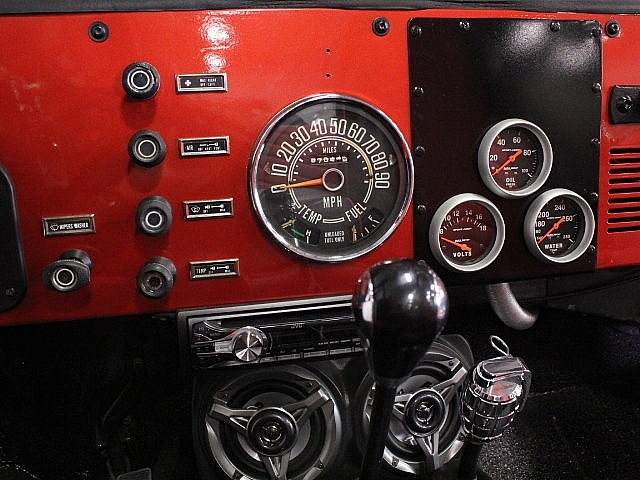 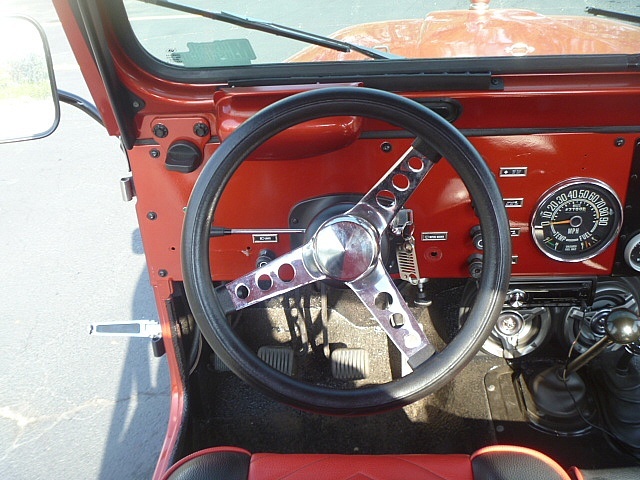 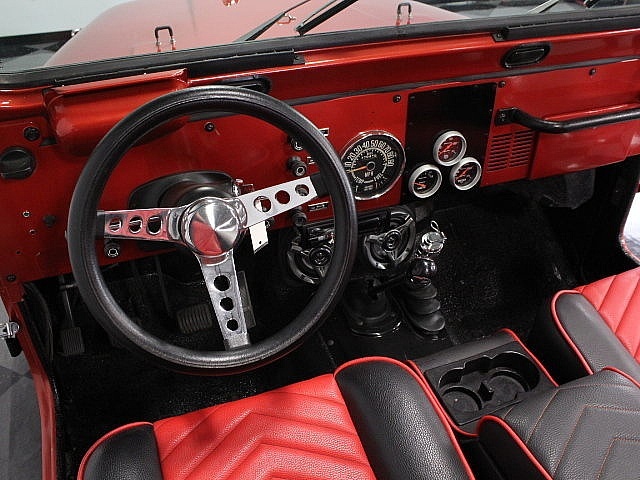 The centrally-located Jeep gauges remain in the dash, joined by a trio of Auto Meter dials for temperature, oil pressure, and voltage. 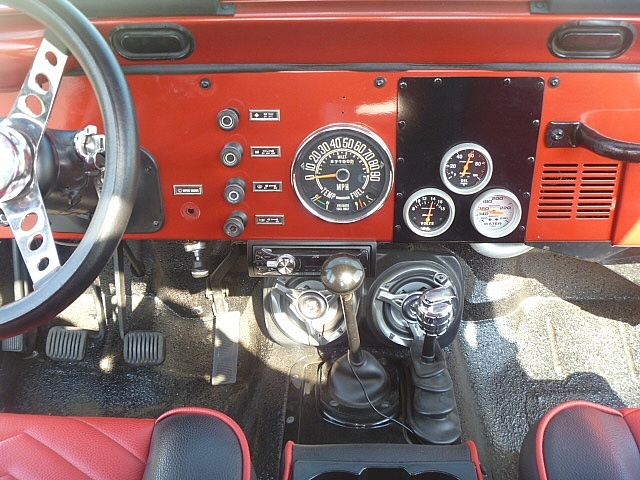 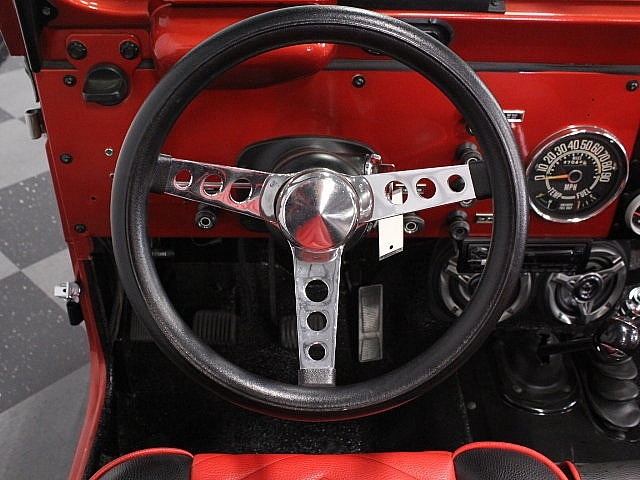 There’s a modern AM/FM/CD stereo with speakers in a custom housing under the dash and both shifters have new boots and custom knobs,no new dual optima batteries has been installed for no starting or radio power issues, with the transfer case’s knob looking like a chrome hand grenade. 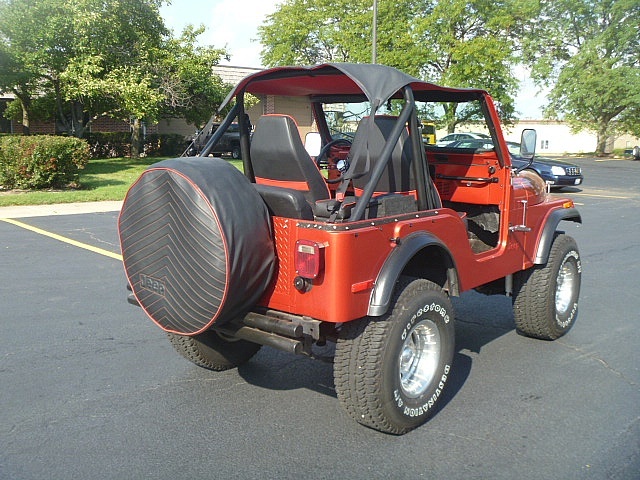 For emergencies, there’s a removable bikini top, but it’s mostly to keep the sun off you during those hot days playing in the mud. 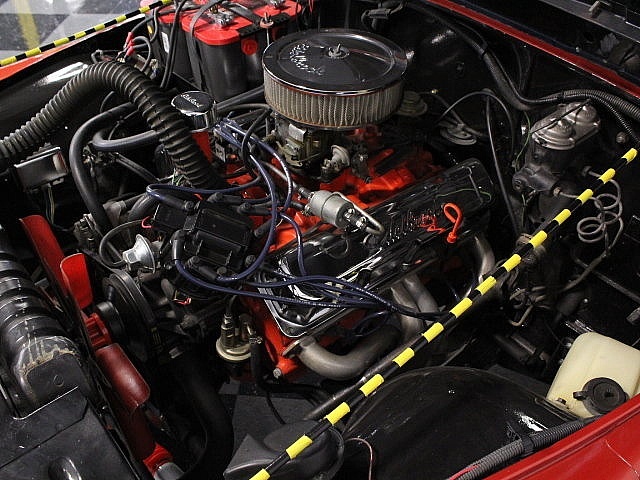 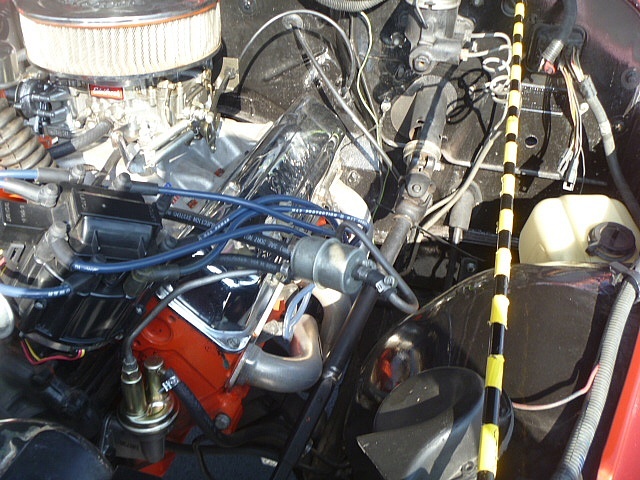 AMC’s reliable 304 cubic inch V8 is incredibly torquey and virtually indestructible, with its edelbrock intake and 600 cfm carb and driving through a 3-speed manual gearbox and a two-speed transfer case it will go just about anywhere. 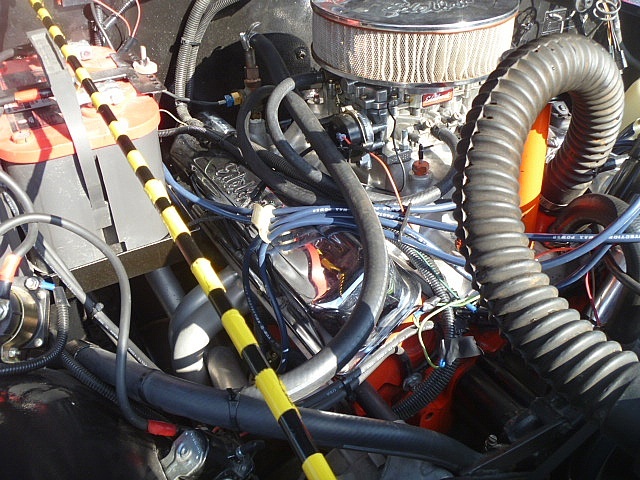 It looks great under the hood with fresh engine enamel, a chrome air cleaner, and an open-element air cleaner, and there are a lot of new components throughout. 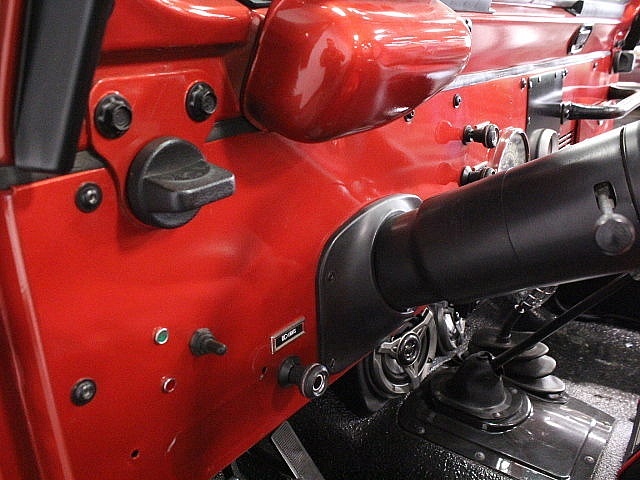 An HEI ignition system lights the fires and there’s a lot of new wiring to ensure reliability. 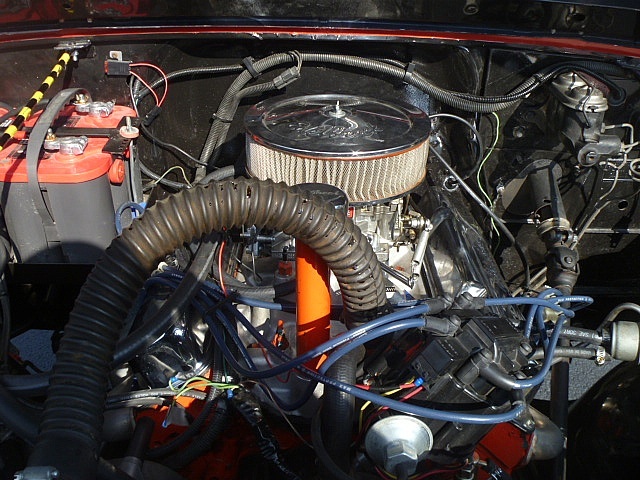 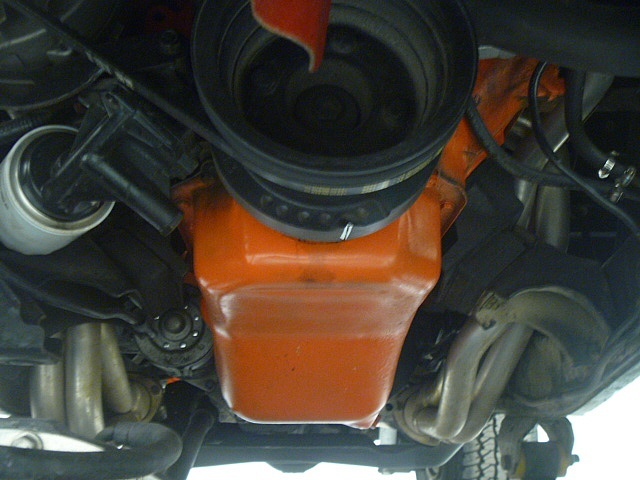 Long-tube headers feed a great-sounding dual exhaust system with turn-downs just behind the rear axle, so it has a muscle car soundtrack when you’re running hard. 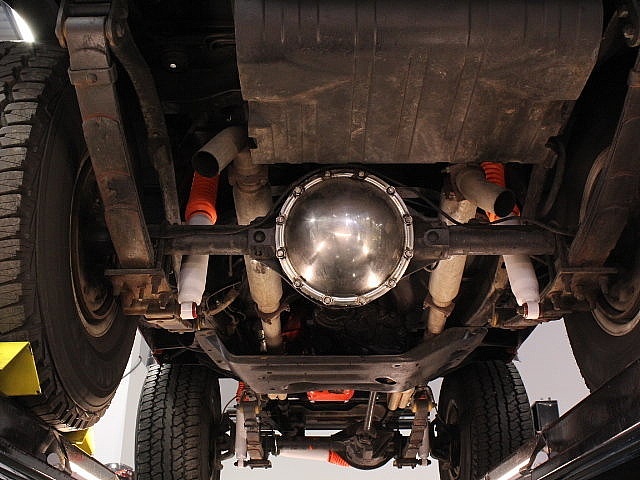 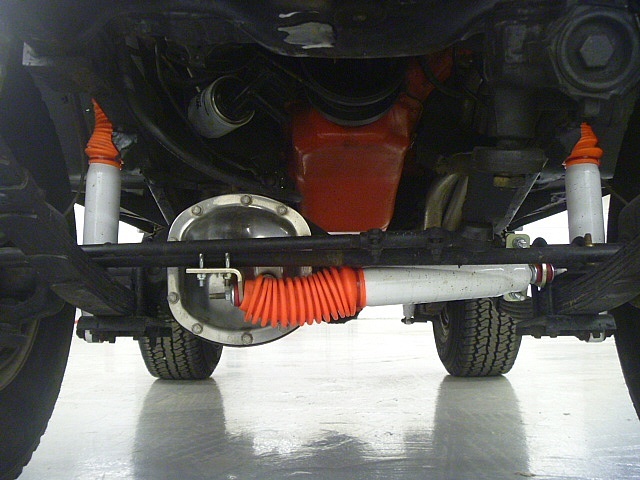 An upgraded suspension with a modest lift and new shocks all around ensure that it’ll go through the rough stuff without complaint. 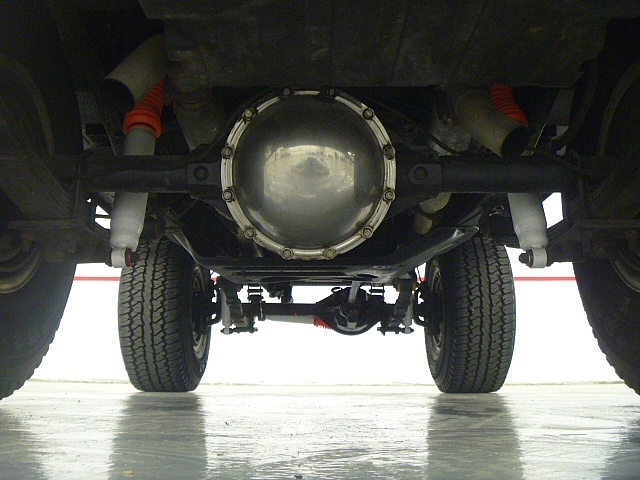 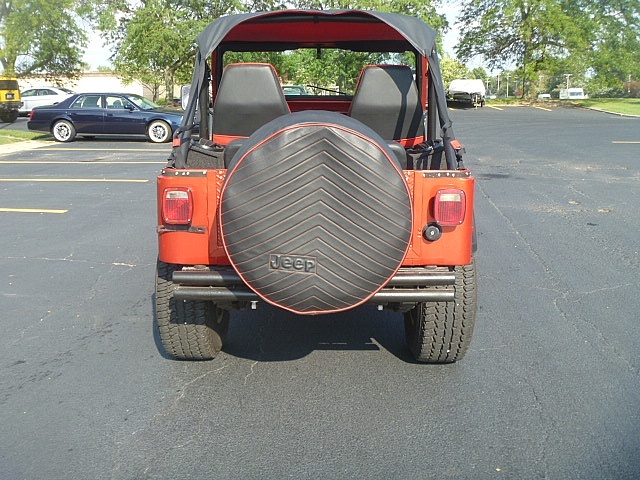 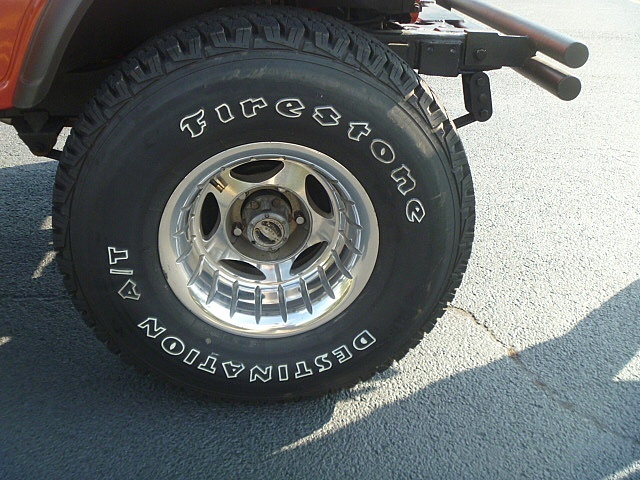 Polished Centerline wheels are a great choice on a flashy Jeep and wear oversized Firestone off-road radials. 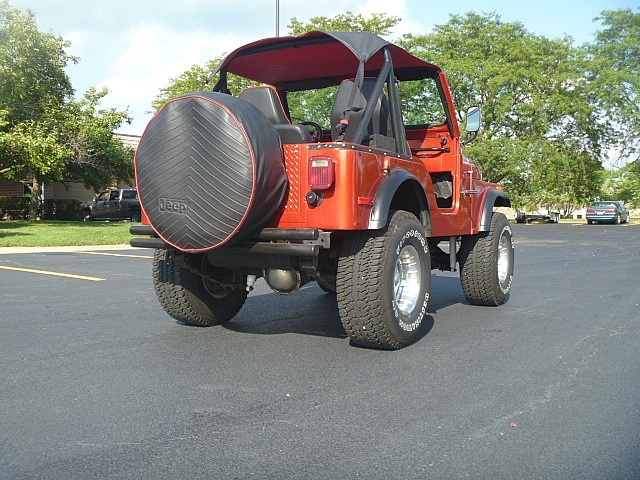 Go ahead, have some fun, this Jeep was built for it. 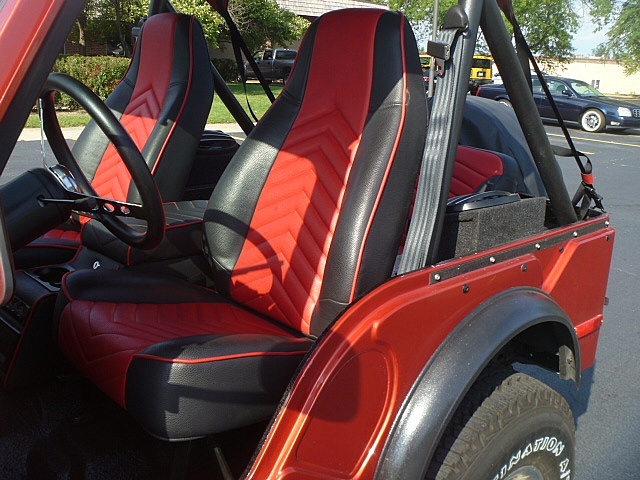 Finished in 2011 with lots of top-shelf gear, it represents the most affordable way to have fun on four wheels in the great outdoors.